FastPictureViewer Pro, the fastest image viewer, EVER. Designed for photographers. Built for speed. Runs perfectly on Windows 10, Windows 8.x, Windows 7, and Windows Vista/XP. Save time: preview, cull and rate pictures faster than ever before! 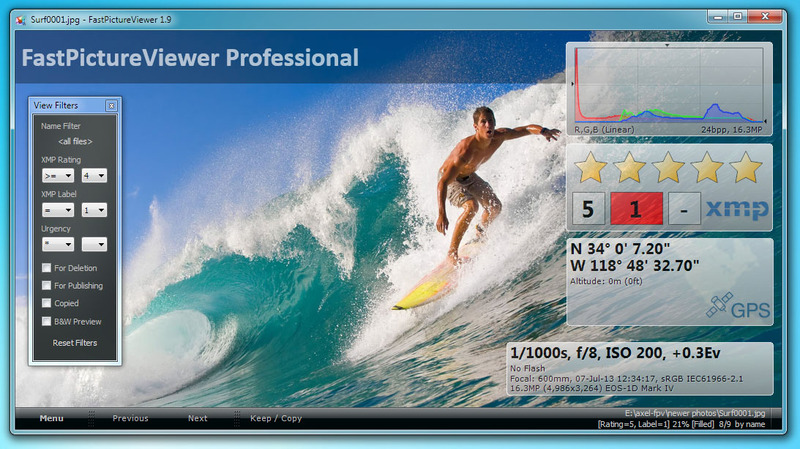 Fastest ever: point FastPictureViewer Professional at your image's folder and start reviewing, culling and rating within seconds, in RAW or JPEG format, be it 10 images or 10,000: no wait. Google fastest image viewer and see who comes on top: 3 million users and counting cannot be wrong! Full support for 4K & 5K monitors and beyond (perfect scaling, no tiny fonts!) - Full color management. Best delete functions in industry: Del key (to Recycle Bin or permanent), X-key to tag, then Ctrl+X to delete in batch. While you evaluate an image, FastPictureViewer uses the native 64-bit power of your computer to prepare the next picture. When you are ready to move on, FastPictureViewer displays the next image instantly: no wait, not even a fraction of a second, when your computer has enough spare muscles to load two or more images at once. We could go on and on with geek talk about DirectX and Direct2D hardware acceleration, speculative image loading, pixel shaders and so on, but all you need to know is there is no faster culling software, at any price. Consider the following example: say you are a wedding or sports photographer coming back from an assignment with 1000 raw images, taken with a contemporary DSLR (16-20MP range). Your first task is to review those images and select the ones deserving to be further processed. Let's assume you'll pick 10% of the images for processing and printing. You have a contemporary computer with a fast processor and fast disks (for example an Intel i7 machine, with one SSD and a fast SATA drive). In this example, using FastPictureViewer Pro before Adobe Lightroom to weed-out the 90% of images that you are not going to process right away makes you save about 50 minutes on a 1000 images job. The majority of the saving comes from not importing all images in Lightroom and wait, then delete or set aside the one you don't want. Delete or set aside in FastPictureViewer Pro, then import only the images you intend to keep or process right away into Lightroom. (*) Average time to import 1000 raw images of about 16-20MP each, and create 1:1 previews for each of them, on an i7-class computer with SSD and SATA discs. (**) The time spent evaluating an image does not influence the time difference: if it takes you 5 or 10 second to evaluate an image then the total times will of course be much longer, but the time saved stays the the same. (***) FastPictureViewer Pro preloads images directly in video memory in GPU-accelerated mode and use the graphic processor to speed up operations such as zooming, panning, black & white preview and lost shadow/highlight spotting. In practice the time saving can be even greater, thanks to the very efficient and speedy operations of FastPictureViewer, which virtually never makes you wait: for example the rating feature, where you give one to five stars to an image or assign it a color label, is instantaneous. If you use the single-click file copy function, you'll find that the program performs the copy operations in background without making you wait, effectively making the file copy appear instant. Everything in FastPictureViewer was designed for speed and efficiency! The ratings, captions, keywords and color labels set in FastPictureViewer Professional will be readily imported into Adobe Lightroom and other DAM software, thanks to the industry-standard Adobe XMP metadata standards those programs adhere to, making FastPictureViewer Pro the perfect time-saving front-end companion to Adobe Lightroom and other DAM's image development and picture organization features! Fastest RAW image viewing and culling for photographers. Robust graphic file formats support for Microsoft Windows. FastPictureViewer Professional is a color-managed RAW image viewer, built for photographers with the aim to speed up image culling, rating and selection. FastPictureViewer is, quite simply, the quickest image viewer ever built, engineered to take advantage of modern 64-bit hardware and powerful graphic cards, delivered in a slick content-first user interface. Full color management incl. profiled monitor. Advanced batch file management, web upload. EXIF, IPTC, GPS, XMP, RAW... truly photo-oriented. Rock-solid, stable and dependable performer. Works perfectly on Macs through Parallels Desktop. The FastPictureViewer Codec Pack is a Windows extension providing support for many additional image formats to Windows Explorer and codec-enabled applications. Supported formats includes Adobe Photoshop PSD, RAW formats from 580+ digital cameras, HDR formats and formats used in the computer graphics industry, as well as thumbnail support for Adobe InDesign and more. This product is a one-stop shop for robust additional image formats support in Microsoft Windows, from XP to Windows 8.x, with full native 64 bit support and is trusted and used by the biggest names in the industry, including Sony Online Entertainment, Electronic Arts, Blizzard Entertainments and many more, as well as hundreds of thousands of photo studios, photographers, photo enthusiasts and graphic artists in more than 200 countries around the world. most digital cameras and DSLRs, sports cams (like GoPro™) and, last but not least, the fastest USB 3.x card readers. Get if now, free from the Windows Store. 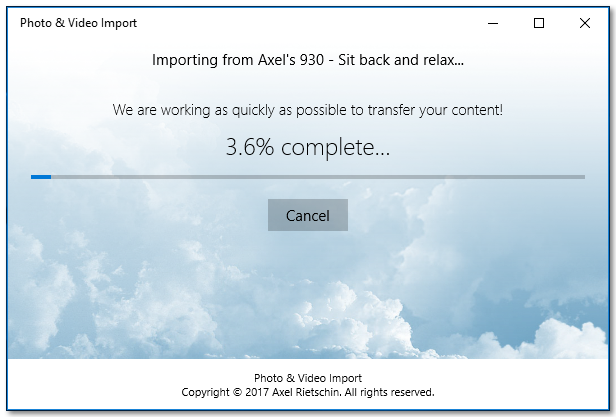 FastPictureViewer Professional supports direct upload to pro-oriented photo websites such as Zenfolio: export and upload JPEGs, TIFFs, RAW files, everything, directly to your Zenfolio account with optional automatic sRGB conversion, rescaling, metadata stripping and more! FastPictureViewer Pro has an innovative content-first user interface that puts the most important thing forward: your images. There is no multi-level cascading menus with hundreds of options, and no stack of toolbars full of tiny cryptic icons. Instead, most of the display surface - up to 100% of your screen - is used to display the most important thing of all: your pictures. Everything else - the program's taskbar, or the floating gadgets like histogram or EXIF shoorting data - is optional and can be hidden from view at the press of a key: FastPictureViewer never gets in the way of your pictures and all key functions - navigation, rating and the advanced functionality provided through plug-ins - can be accessed from the keyboard, while zooming to 100% is simply done by clicking on the image. FastPictureViewer Professional is "the Porsche of image viewers" -- c't - Magazin für ComputerTechnik, Germany, Issue 19/2008. “I’m a big fan of FastPictureViewer Pro: super-fast, histograms, EXIF, everything we need” -- Simon Moran, Photography Director, iStockphoto LP. “Overall I think FPV Pro will be the best available companion for Lightroom” -- Hermann K, FastPictureViewer Pro user from Germany. FastPictureViewer Professional can be used in many different ways by very different peoples: photographers looking for an efficient way to cull batches of new photos before "developping" them using their usual tools, photo editors reviewing thousands of images per day in search of that perfect cover picture, or photo enthusiasts admiring their photo collection. We have prepared three different usage scenarios below, each highlighting different aspects of the product. FastPictureViewer Professional is a perfect companion to existing Digital Asset Management suites such as Adobe Lightroom or IDImager, helping users perform their initial accept/reject selection and rating much faster than before. Put in another way, you'll be done with reviewing/culling/rating in FPV Pro before Lightroom finished importing all your files and churning the previews. You'd then only import the keepers and end up saving a lot of time. Get the free trial and see for yourself. FastPictureViewer Professional supports most image formats and comes with first-class support for raw formats from more than 400 digital camera models, while support for specialized formats - such as Photoshop PSD, OpenEXR, JPEG2000, TGA, PNM, HDR or DDS - can be added through our own FastPictureViewer Codec Pack add-in. Our viewer can also be extended by 3rd-party image decoders such as DjVu, supplied by other vendors, with more to come in the future. See our Help and Tutorials page for in-depth coverage of the program's main functions, including an extensive Getting Started guide. Also see our Frequently Asked Question (FAQ) page and visit the User's Forum, including it's ever expanding How To section! Grab the trial version from our download page and feel free to contact us if you have any questions: we're always glad to hear from visitors! Fastest raw image viewer ever. Period. Native 64-bit suppport, multi-processing and GPU-acceleration all contribute to the unparallel speed of FPV Pro. Instant zooming to 100% view, for quick sharpness checks: just click on the image to zoom-in, release the move to get back. Fastest and best in industry! Real-time RGB histogram, EXIF shooting data, color eyedropper with shadow/highlights and Adobe XMP Rating/Label/Urgency gadgets. Instantaneous, single-keystroke copy/move of your "keepers" to a preset folder (background copy/move) - just press K to keep an image. Rules-based, scriptable batch copy, move, delete, save-for-web automation, multi-threaded parallel execution. Flexible file management! Instantaneous display of the next image in line (when computer resources allows) through speculative image pre-loading and in-memory caching. Instant industry-standard Adobe XMP compatible rating and tagging, embedded in standard formats (JPG, JPEG-XR, TIFF) or in external XMP sidecars. Supports RAW formats, from 460+ digital cameras models, incl. EOS 1D X, D4/D800/J1/V1 and many more. Native 64-bit and 32-bit editions for Windows 8.x Desktop, Windows 7, Windows Vista, XP SP3 and XP64, multi-core and multi-processor enabled to take full advantage of modern computer hardware, with optional Direct3D GPU acceleration: FPV Pro absolutely flies on 2012 hardware and will squeeze every last bits of your computer's performance. FastPictureViewer Professional was inspired by a 2004 article from writer Eamon Hickey, describing the near impossible workflow of a picture editor working for Sports Illustrated and reviewing more than 16,000 raw files in just 6 hours. Check Eamon's article - an excellent and entertaining read for any photo enthusiast - and if your workflow even remotely resembles what he describes then FastPictureViewer Professional is exactly what you need to get the job done. The more pictures you have to review, the better: FastPictureViewer Professional was designed to handle large digital images thousands at a time and makes it easy to quickly view, rate, backup, copy, move and delete almost any number of photos. 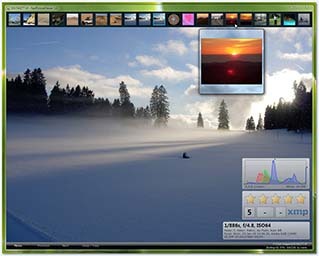 The software was also designed with the needs of photographers in mind, so it supports industry-standards and first-class color management, along with essential tools like EXIF and RGB histogram, always available in floating "head-up-displays" that update themselves instantly, so they can be checked for every image without additional keystrokes. FastPictureViewer does not try to be the next Swiss Army knife of image viewers, on the contrary it's a simple program that does a few things very well, but don't be fooled by the slick user-interface: the software has many powerful functions including second-to-none rule-based batch file management, resembling Microsoft Outlook™ message rules, that let users perform any copy/move/export jobs in just a few clicks, exploiting the parallel power of modern computers. FastPictureViewer Professional comes with a fast export-for-web function that creates web-ready small and medium size JPEGs, with optional sharpening, from any supported image format: great for quick web uploads, or to hand (or email) low-resolution proof copies to customers right after a shoot. The exported JPEGs exhibits an ideal balance between file weight and image quality, making them perfect for use on websites and photo-sharing communities. Our software is a great replacement for ViewNX2 as a NEF viewer, providing greater speed and much improved stability. The program can also be used as an excellent CR2 viewer as well as for any of the other 20+ raw formats directly supported. It is also the only native 64-bit, multicore-enabled application of its kind. Axel Rietschin Software Developments, author and publisher of FastPictureViewer Professional and the FastPictureViewer Codec Pack products, is a privately held "family business" established in Geneva, Switzerland, the country of precision watches, delicious chocolate and blazing fast image viewers. Axel started serious programming and hobby photography as a youngster almost at the same time, getting his first C compiler in 1983 and a Nikon FA shortly thereafter. He learned the rudiments of photography from his long-time friend Philippe Ayral, renowned French visual artist and former photojournalist, helping Philippe get around his first Apple II then Mac 128K computers at the same time. Axel first worked independently then for several companies ranging from small startups to huge multinationals, as software design engineer, lead developer, systems architect and CTO, before beginning formal studies of mathematics and starting the FastPictureViewer projects as a side job in early 2008. FastPictureViewer Professional has reached its 1st million downloads during February 2011.